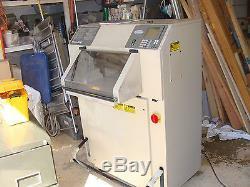 Challenge Titan 200A Programmable Hydraulic Paper Cutter 2002 with, blade changing tools, plastic cutting sticks, & manual. Can be moved by small Uhaul with lift gate. 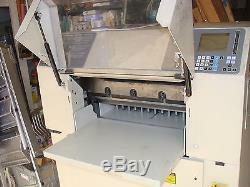 The Titan 200 is a 20 inch width programmable fully-automatic paper cutter with hydraulic clamp and hydraulic blade. The digital display shows back-guage position and all programming and maintenance information. Bright light line light cut position indicator. Features Include: 20" Cutting Width, 3-1/4" Clamp Opening Hydraulic Clamping & Cutting Easy to Read LED Digital Display Line Light Cut Position Indicator Hydraulic Motor Runs Only During Cutting Cycle arrange Plexiglas Safety Shield Rear Table Safety Cover Single Cut Button works only when guard closed Heavy Duty Casters Cast Iron and Steel Construction Electric: 208V/230V 1-Phase, 60 Hz, 12 Amps Electrical Socket (NEMA 6-15R or 6-20R) Titan 200 Automatic Cutter Specifications Cutting Width 20" Cutting Height 3.25" Clamping Method Hydraulic & Manual foot lever Min. Narrowest Cut 0.5" Cutting Length behind Knife 20" Table Length in front of Knife 16" Table Height (from floor) 36" Dimensions 36" W x 53" H x 49 Weighs 760 lbs. 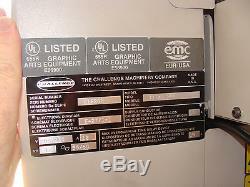 The item "Challenge Titan 200 20 in. Paper Cutter" is in sale since Tuesday, February 28, 2017. This item is in the category "Business & Industrial\Printing & Graphic Arts\Bindery & Finishing Equipment\Paper Cutters & Trimmers". 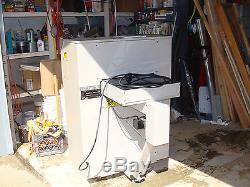 The seller is "lazynoie" and is located in Mantoloking, New Jersey. This item can't be shipped, the buyer must pick up the item.